I was going to just append this video to my original Fotga Sony Remote article, but there are sooo many RX10 Mark II Camera Owners that I decided to just post this up separately to show the functions this remote has with the RX10MKII. You can see with my little shoulder rig, I can continue to have the best stability because I never have to take my hands away from the handles when performing functions on the RX10 MKII . 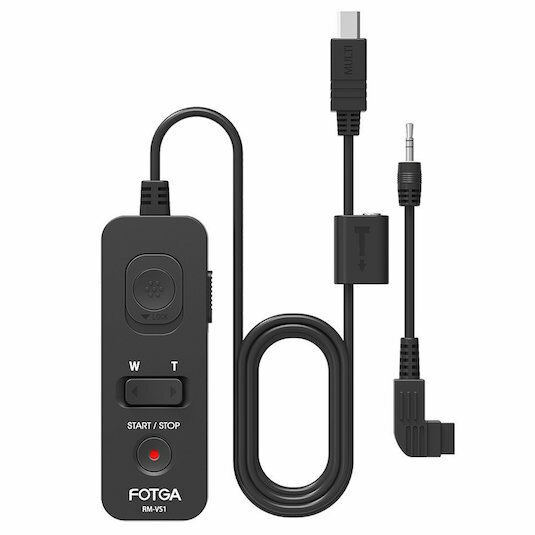 Once again, here's the link to the Fotga Remote for Sony Cameras. Posted in dslr video. Tags: control zoom lens remote, fotga sony remote, rx10 MKII, RX10MKII, Shutter Remote, sony markII, sony remote rx10 mark II, start stop video remote on September 23, 2015 by Emm. So you've got the brand new fancy Sony DMC-RX10 MarkII capable of 4K internal video, SLOG profiles, and high frame rates. How do you step it up a bit? 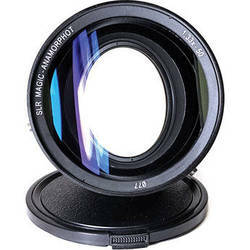 Well how about throwing on the SLR Magic Anamorphot Lens Adapter for some Anamorphic fun? I've had this adapter laying around for quite some time, but even with it's built in diopter it was tricky to use with the GH4. Finding the right combination of lenses and pulling focus made it just too cumbersome and slow to use. But with the Sony RX10 Mark II, the SLR Magic Anamorphot Lens Adapter just works fairly seamlessly. Pulling focus is done by just using the manual focus ring around the RX10 built-in Lens. Here's a few more random examples of the SLR Magic Anamorphic Lens Adapter mounted to the Sony RX10 MarkII shot in my backyard at 1080p at 120fps. My earlier tests at mainly F/4 were still a bit soft, but I know the camera and lens combination is capable of better. So I decided to go back out and stop down the aperture to F/5 - F/5.6. I also changed to the 4K resolution. Here's an example of the Sony RX10 Mark II with the SLR Magic 1.33x Anamorphot Lens Adapter shooting in SLOG, De-Squeezing the video, and then adding a generic LUT. Still nothing interesting to shoot, but I think the images are sharper so I'll know what settings to use when i'm ready for a project. While this may not be the best Anamorphic setup, it's certainly affordable and offers great results with minimal effort. This combination would be a good start for those who want to start experimenting with anamorphic, and remember the RX10 MKII is capable of shooting in 4K. Keep in mind that my adapter is the older 1.33x anamorphic, but SLR Magic has recently released a 2x Anamorphic Adapter which will give you even greater Anamorphic perspective and qualities. The Sony RX10 Mark II is the easiest camera I have used with this adapter, and that 2x is certainly next on my list. Posted in dslr video. Tags: 120fps anamorphic, 4k anamorphic, rx10 II, RX10 Mark II, RX10MKII, slrmagic slr magic lens adapter anamorphic, sony rx10 anamorphic, sony rx10 anamorphot, sony slog2 on August 12, 2015 by Emm. After testing out a couple of the different HFR (high frame rates) with the Sony RX10 Mark II, the 240fps setting looked very usable. Today I went around shooting random samples with just this one setting. Prior to shooting in 240fps (or any HFR mode), you have to prepare the camera into 'Standby Mode'. Once the camera is in Standy, you can't adjust any settings (aperture, zoom, ISO, etc), and you can't adjust focus. So it's a bit tricky especially when working handheld. Unlike the 120fps in which you can shoot all day, the 240fps will give you about 1 second of recording (maybe shorter). After that brief second, it takes several seconds to save the recording to the SDXC card. You really have to time your shot to fit into that one second of recording. I still think the GH4 is capable of producing better footage (especially in low light), but the RX10MKII offers a bunch of features and some not found with a GH4. To match the focal range on a GH4 with what is available in the RX10MKII, I would have had to bring my 12-35mm F/2.8 OIS + 35mm-100mm F/2.8 OIS lenses. When traveling or on vacation, it's just easier to work with one lens. Both cameras will give you 4K internal recording, but the GH4 only offers up to 96fps while the RX10MKII can shoot 120fps all day + options for up to 960fps (240fps is probably the max I would use). I also enjoy having an ND Filter option built in with the RX10 MKII instead of having to carry ND filters. Both cameras will offer 4K Internal recording and the stabilized zoom lens on this RX10MKII allows you to shoot very stable footage so that you don't always need a monopod or tripod. The RX10 even offers a de-clicked aperture ring so that you can adjust exposures on the fly. There's a microphone input and Headphone output as well, so you can use this as a full run-gun event or documentary camera. The footage in the video above was shot in SLOG2 mostly ISO 1000 - ISO 2000. I'm still not happy about coloring SLOG2 on this camera (it's different than A7s, but I think eventually I'll find the right settings as I keep trying. Posted in dslr video. Tags: disney, disneyland, High ISO, nd filter, rx10 240 fps 240fps, RX10MKII, slog2, slomo, sony dsc-rx10. 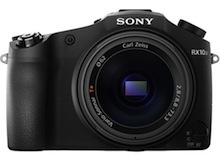 slow motion, sony rx10 mark II on August 3, 2015 by Emm. I just got the new Sony RX10 Mark II in yesterday and obviously the amazing thing about this camera is it's High Frame Rate feature. Here's a quick capture testing some of these HFR settings. I still have to learn how to use it, because once you go into HFR Mode, the camera goes into Stand By and will not let you re-focus or change anything. You have to setup your shot, then go into Stand By mode, and then finally record when you're ready. Depending on the HFR mode, you can only record for a quick second or two. Of course at 60fps or 120fps 1080p, you can shoot all day. The HFR mode is for 240fps, 480fps, and 960fps. Also you have to play with different shutter speeds at different frame rates to get sharper images with less motion blur. So forgive the footage if it's out of focus, or has too much motion blur. The different frame rates will also cause different crop views. You'll notice the 960fps setting is more 'cropped' than the the other frame rates. Be careful, don't get the wrong one. The label on my SDXC Card specifically says 80MB/s and U3. 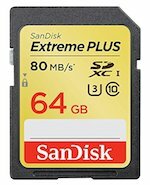 It's odd because I can't find the same card on B&H, but definitely the Sandisk Extreme Plus U3 on Amazon is exactly like mine. I'll be doing a little more in depth about the camera, but if you have any questions about this camera, leave your comments. For those of you on the fence, I think you'll definitely be impressed by all the many features and overall quality of the camera. In stock and available at B&H (here). Posted in dslr video. Tags: High Frame Rate, High Frame Rate Card, RX10 HFR SDXC Card, RX10 Mark II, RX10 MarkII, RX10 Slow Motion, RX10MKII, SD Card, U3 card on July 28, 2015 by Emm.